Sir James Smiths School is a small comprehensive school for 11-16 year olds. The school approached NCI because they needed to facilitate the adoption of computer programming and engage students who wouldn't normally be interested in computing or science. In addition, the school were keen to develop teaching and learning for students with special educational needs. The NCI team provided five mini-humanoid robots for use throughout the school. Software included the ASK NAO package for children with autism and other special educational needs. 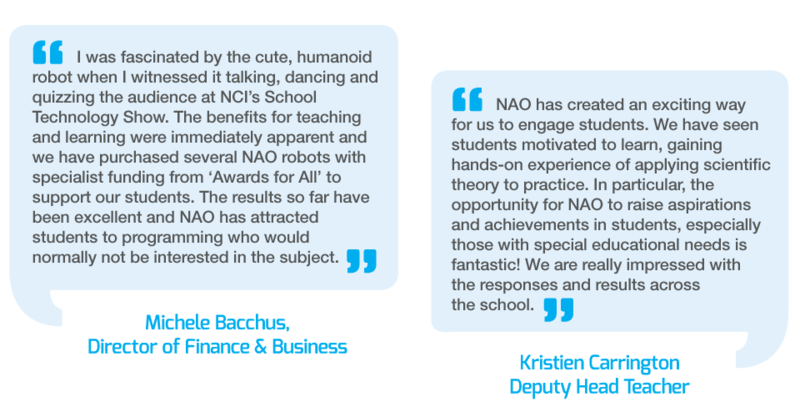 The staff and students found programming the NAO robot simple and thus were able to quickly utilise the robots for various activities throughout the school. NAO became a member of staff, a friend to the students and a facilitator for student teams. Brochure - Bring programming to life!